Home » Blackjack • Blog • Casino Games • Latest News » Is Blackjack Really the Best Casino Game? Is Blackjack Really the Best Casino Game? 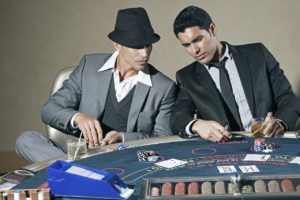 Why blackjack is best at casinos on land (not online). It’s been said time and time again. Blackjack is the best casino game you can possibly play. It’s moderately paced, relatively inexpensive, and available at every full casino in the world. Basic strategy is easy to invoke, and the house edge is incredibly low when you do. What’s not to love about it? That really depends on where you play the game, and just how strong your devotion to strategy lies. If you’re playing blackjack at a terrestrial casino, most of these conventional beliefs apply. If, however, you intend to play blackjack at online casinos, you might want to reexamine the boilerplate. There are only so many similarities between live and online blackjack games. The three most significant differences between them are the very three reasons why blackjack is the best casino game on land, but not online. Live blackjack tables offer strategic superiority for those willing to work for it. If you possess the patience and mental fortitude to invoke a perfect decision-making strategy, and count cards without err, you’ll have the best odds of winning. The computerization of digital blackjack is the dividing line between online and live games. The RNG shuffling algorithms are complex; perfectly capable of delivering the exact same randomness and unpredictability of a human shuffler and dealer. However, the human dealer does not reshuffle after each hand. Electronic blackjack games do. Therefore counting cards is pointless online. Expanding on the previous topic, a live blackjack game affords players the chance to play with a positive expectation. An astute card counter can reverse the traditional “house edge” to gain a “player edge”. No other casino game in the world can claim such affability towards players. It’s certainly no easy task, mind you. Invoking perfect strategy, counting cards, and increasing bets at the right moment sounds simple enough. Doing it in front of a live dealer and scrutinizing pit boss, without drawing suspicion – that’s the hard part. It’s not that it’s illegal, but most casinos do have the right to refuse service without reason. Those that don’t have that right can tell their dealers to reshuffle as often as they like. Either way, get caught, and you’re card counting days are over. There’s a sense of kinship – a loyalty among fellow players – that online blackjack simply cannot mimic. That communal experience is priceless. For one thing, it develops a more exciting atmosphere wherein players route for and sympathize with one another. Secondly, it helps us remain aware of our surroundings and situation. Playing online blackjack offers no such safe-guards or affable environment. It’s so easy to get stuck in a stare-and-click mindset. Once this happens, the games aren’t even fun anymore. Remember that blackjack is best at casinos on land only. If you do play blackjack (or any other online casino games, for that matter), make sure to take regular breaks and switch things up often. As I said above, even the best casino games have a negative expectation. Take your time and make entertainment the priority. Otherwise, you may find yourself throwing money away.